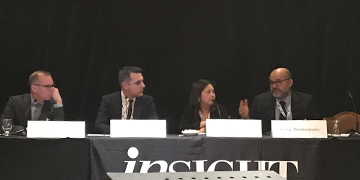 Fengate’s George Theodoropoulos, Managing Partner, was onstage at the Canadian Alternative Investment in Pensions (CAIP) Forum this week, sharing his key insights on infrastructure development opportunities in Canada and abroad. The panel focused on opportunities for pensions, with the establishment of the Canada Infrastructure Bank and its estimated spend in new infrastructure development expected to exceed $50 trillion by 2030. Discussion also covered how top pensions are participating in global transactions to generate steady cash flow, while positioning for solid long-term growth. CAIP forums have served over 1,000 institutional investors and senior executives with total fund oversight from the top 100 pension plans across Canada.